Get moving for Exercise Right Week 2018 at Your Health Hub. This theme of this year’s National Event is Motivation to Move. 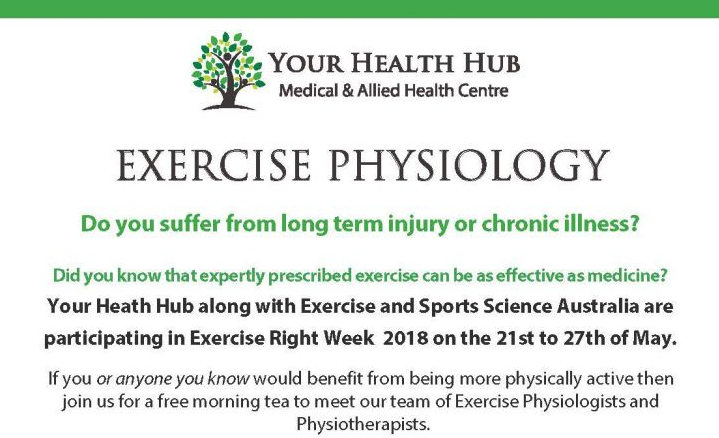 To celebrate the Exercise Physiologists at Your Health Hub will be hosting a morning tea Tuesday the 22nd May at 11.00 am. Come along and have a chat with them about how prescribed exercise can help you! Call 61220150 today to book your spot and drop into our Health & Fitness Studio tomorrow morning for a cuppa and a chat!